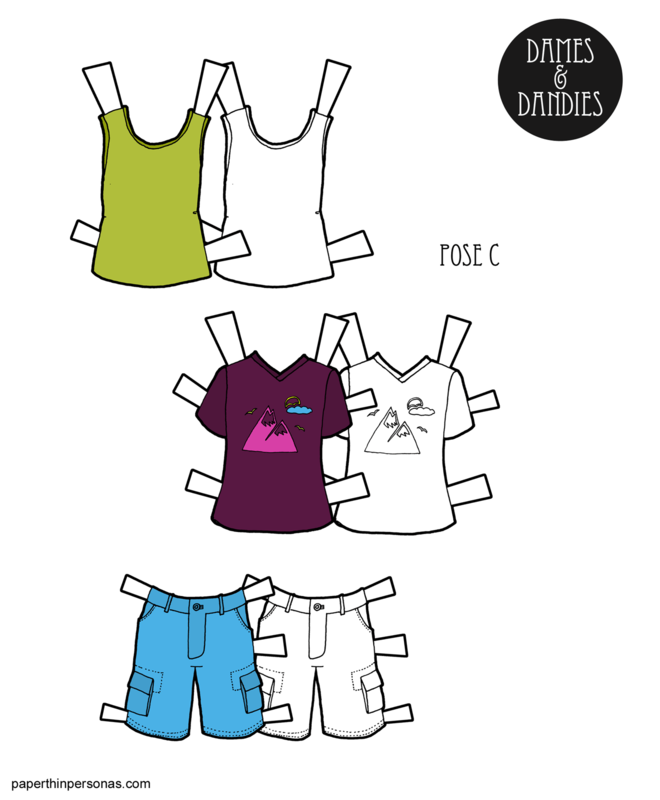 Printable Black & White PDF Printable Color PDF More Paper Dolls & ClothesPeople who have been following this blog for a while know that I like to work in batches. For my sanity, I usually try to keep my batches to four or five paper doll outfits at most. I recently finished a big batch of C Pose guy paper doll clothing. So, since I think they’ve been a bit neglected as of late (the last C Pose set was back in April), I thought I would devote this whole week to guy paper doll clothing. That’s right. A whole week of guy stuff! And we’re starting with some contemporary summer clothing. So, today’s colorful set of guy clothing is thanks to my friend and his liberal views of men’s clothing colors. I confess I am kinda conservative in the guy clothing color schemes. I am trying to spread my wings and go for something different today. After all, everyone should get to wear whatever colors they like. By the way, if you missed it, Friday’s paper doll was this fun B Pose superhero and there’s an second color scheme for that on my Patreon page for anyone to download and print if you want. It’s also in a purple and pink color scheme. I guess I’ve just been in a purple mood as of late! That graphic t-shirt is great – my son has something similar! I love the colors. I think there’s been a shirt towards a broader range of colors for boys & men. I can’t speak for all men but I know the men in my house are enjoying the additional color options for their wardrobes!